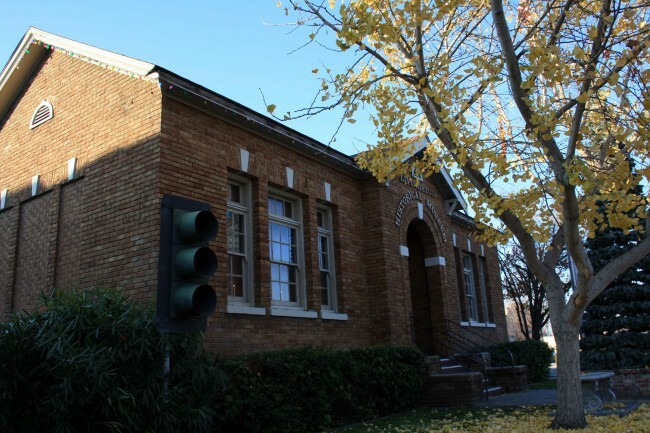 On the northern edge of Merced County, the town of Livingston boasts an interesting historical museum. It’s a great place to stop on a Sunday afternoon when it is staffed by members of the Livingston Historical Museum Foundation from 2 to 4 PM. Located on the corner of Main and C Streets in downtown Livingston, the museum’s collections are housed in a brick building that once served as the town’s city hall and courthouse. The town was named for Dr. David Livingstone, a British explorer of Africa who was an international celebrity in the late 1800’s. An error on the town’s Post Office application resulted in the difference in spelling between his name and the town’s. 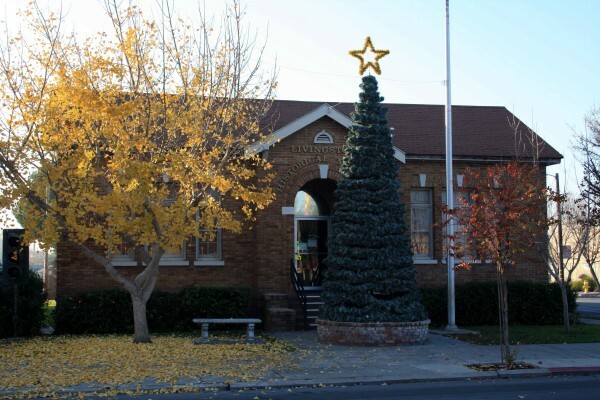 Although the town’s original streets were laid out when the railroad arrived in the 1870’s, real growth began when irrigation water became available in the early 1900’s. Like its neighbors Turlock, Hilmar, and Atwater, much of the settlement was accomplished through the colony system. Land speculators bought large tracts of land and then subdivided them and sold the subdivisions to farmers on credit. These colony subdivisions were often marketed to specific ethnic groups through cultural networks and home-language periodicals. Best-known of these colonies was Yamato, settled by Japanese-Americans. The museum has an excellent collection of photographs and artifacts from these early settlers. Their first years in the area were challenging, but hard work and determination ultimately led to success. During WWII, prejudice and war hysteria led to the incarceration of 110,000 Japanese-Americans in internment camps throughout the western states. The museum has many examples of art created by the internees in the camps after they were forced to leave their homes. One of the inspiring stories to come out of this sad time in our history is that of how the land and property of Livingston’s Japanese-American farmers was protected by a corporation formed by these farmers and placed under the control of a European-American lawyer. Unlike most other Japanese-Americans, these farmers got most of their property back after they were released. You can learn more about this story at the museum. Fittingly, Livingston’s sister city is Wakami, Japan. The museum displays a collection of gifts from Wakami. 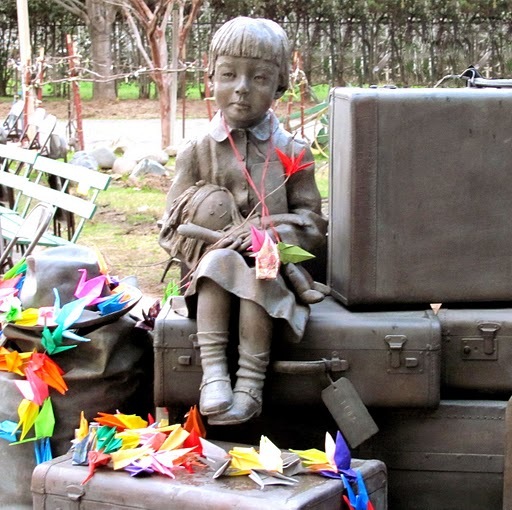 For more information about Japanese-American internment, you can also visit the Merced Assembly Center Memorial at the Merced County Fairgrounds. 4,669 Japanese-Americans from areas surrounding Merced and Livingston were held at the Merced Fairgrounds for five months before spending the remainder of the war at Amache, Colorado. The story of the internment is told by plaques bearing the names of the internees, historical displays, and a sculpture. This simple, highly effective sculpture depicts a young internee seated on a pile of suitcases awaiting an unknown and frightening future. Livingston has drawn people from around the globe. In addition to Japan, many of its residents and their ancestors have come from the Azores Islands, the Philippines, Mexico, and most recently, India. The museum displays cultural artifacts from all of these groups. In front of the museum you can see the famous Livingston stoplight– the last remaining stoplight on the 275-mile stretch of Highway 99 south of Sacramento and the site of many accidents until community leaders finally convinced the state to rebuild the road as a modern freeway in 1997. As a teacher, I was especially interested in the collection of photographs of the original Livingston High School. Built in 1924, it was one of the first high schools in the county. The photos depict how much education has changed since that time. Although Livingston is still a small town, it has seen a lot of change in the last 100 years. The Livingston Historical Museum does an excellent job of showing just how much change has occurred.